Any data entered into a Formidable form can be displayed on your site using Views. Learn about what the Basic and Advanced settings do so you can accomplish more with your Views. If you're ready to create a View, you may follow these step-by-step instructions. Use Entries from Form: Select the form that contains the data you would like to display. View Format: You can display All Entries, a Single Entry, Both (Dynamic), or a Calendar in your View. This View Format lists all entries from the specified form. Choose this option when you do not want a detailed page for each entry. Any text you add to the "Content" box will automatically be repeated for each entry. This View Format only displays one entry. As a result, you can use a combination of the Order and Filter advanced settings to determine which entry will display in the View. This View Format lists all entries with a link to a more detailed single entry page. When you select this option, a Detail Link section will appear. Learn how to use this in the Dynamic Content section and Detail Page Slug section below. The "Content" box should be used to add all the field entries you would like listed and the "Dynamic Content" box is for the detailed single entry. Any of the text in the "Content" box will be repeated for each entry. See the demo page for an example of a Dynamic View. Show entries in a calendar format. Each event on your calendar can be turned into a link to a more detailed single entry page. When you select this option, four dropdowns will appear. Event Date: Determines where an event will appear on the calendar. For example, if you select "Entry Creation date" from this dropdown and you create an entry on March 1st, 2013, the entry will appear on your calendar on March 1st, 2013. If you have any date fields in your form connected to this View, you can select a date field from the dropdown. End Date or Day Count: Determines when each event will end, if you want to allow multi-day events. If you have a second date field or a number field in your form, you can select this from the dropdown. End Repeat: Determines the end date for any repeating events. If you have repeating events and you would like to set an end date for some or all of the repeating events, select the date field which will determine the end date for the repeating event. Click here to see an example of a Calendar View. Any text added to the "Content" box will be used for each date on the calendar that includes an entry. The "Dynamic Content" box is for the single entry. The Content section is where you can insert fields from your form, text, shortcodes, HTML, etc. that will be displayed in your View. This section will be repeated for each entry in your View. You may present the entries from your form as a table, list, gallery, or any other format using text, HTML, and CSS. The Customization panel in the right sidebar contains links and buttons which will help you insert fields and other shortcodes in your View content. For some examples of what you can do with Views, take a look at some demos. The Disable visual editor for this view checkbox is where you could switch the Content section to the plain Text editor. 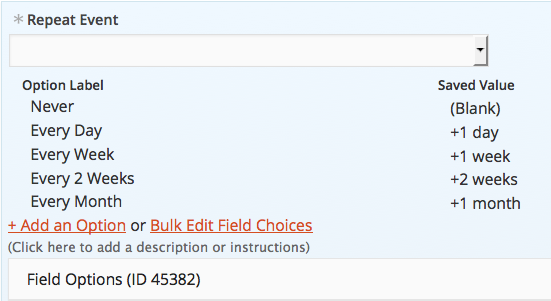 It is recommended to check this box when you're creating a View and would like to display entries in a table, listing format, bulleted or numbered list. These boxes are optional, but the Before Content section is a good place to put table headers or other content that should not repeat with each entry. The After Content section is a good place to put table footers or other content that should not repeat with each entry. If Both (Dynamic) or Calendar is selected as the View Format, a second large text box titled "Dynamic Content" will appear below the After Content box. The Dynamic Content box can use all the same shortcodes and conditional statements that the Content box uses. This box is for the detailed single entry page. Limit the total number of entries displayed in your View. Leave blank if you would like all entries shown. 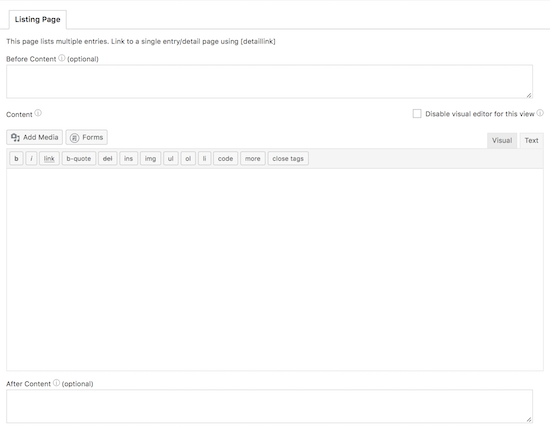 Split your View into pages by setting a page size. Enter the number of entries you would like displayed on each page in the Page Size box. Order your displayed entries by any field, entry creation date, entry update date, or randomly rotate. If you have a Single Entry View and select “Entry creation date – Descending”, then only the most recent entry will be displayed. Likewise, when you select “Random”, a random entry will be displayed every time the page is visited or refreshed. Limit which entries are shown. Entries can be filtered based on parameters in the URL, the current user, date ranges, etc. For more information on filtering views, click here. Enter the message you would like users to see when there are no entries to display. This option will only appear if you selected Both (Dynamic) or Calendar for your View Format. This helps you build the url for the detailed entry pages. In the Parameter Name box, add the text which you would like to add on to the end of your site url. The Parameter Value dropdown allows you to select the entry ID or key, which will also add on to the end of your site url. For example, if you type "jobdetails" in the Parameter Name box and select ID for the Parameter Value, your url for the detailed entry page would look like: http://example.com/job-listings/jobdetails/1309/. The ID number on the end is specific to each detailed entry page. If you select Key for the Parameter Value, the ID (1309 in this example) would be replaced with the key which you can optionally define when you edit or create an entry.